When money is at stake, the last place I want to be is lost without a clue about what I’m doing or where I’m going. ‘What I’m doing’ worries are solved by index investing, a very simple strategy with a good track record. ‘Where I’m going’ collywobbles are eased by my index investing road map. By following the checkpoints on the map, I won’t stray too far from the straight and narrow. Paying off your mortgage, early retirement, buying a secret volcanic island base – you need to know what you’re investing for. How long you will need to invest. How much money you need to put in (assuming a certain level of return). How much risk you’d expect to take for that level of return. To reduce the risk, you can increase your timescale or contributions. Checkpoint 2: How much risk can you handle? Shooting for higher potential rewards means taking on more risk. But if you spend sleepless nights worrying about your portfolio – or you panic and sell when the markets plunge – then you’re never going to enjoy the rewards. The more cautious you are, the more conservative your investment mix should be. If you’ve stared into the teeth of a bear market then you may already know how much risk you can handle. If not, then one way to know yourself better is by taking a psychometric test. If your goal is less than 10 years away then banking on equity returns could end in tears. Analysis of 116 years’ worth of UK equity performance reveals that the chances of equities beating cash are vastly improved over longer timescales. Equities are a volatile asset class, liable to switchbacks in returns that look and feel like the Oblivion rollercoaster. But over longer periods, you’re more likely to capture the good years that help you ride out the bad ones. You can see the magic in action by playing with the Monevator compound interest calculator. 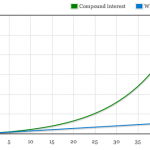 Just hit ‘calculate’ and watch the green compound interest line soar above the blue line. Don’t withdraw income until you hit your target. Reinvest all your dividends and other interest payments. Squeeze your fees – they reduce your returns. Start investing NOW. 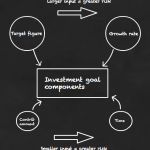 The longer you invest, the more compounding helps. Asset allocation is like dressing for all weathers. Whatever lies ahead – inflation, deflation, market crashes and bursting bubbles – your bets are spread wide enough to cope. (Well, as best as is possible). Many commentators describe asset allocation as the most important investment decision you’ll make. Your mix of assets heavily influences the level of risk and reward you can expect, and how your portfolio will react in different market conditions. Treat your costs like Norman Bates treats his motel guests. Slicing every fee to the bone adds juice to your returns, thanks to the power of compounding. Fund charges – Use simple index trackers and ETFs with low Total Expense Ratios (TERs) and no initial fees. Trading costs – Trade as little as possible and choose cheap, online brokers with low admin and inactivity fees and regular investment services. Taxes – ISA and pension allowances are your friends. A portfolio can mutate into a risk-hungry monster. Picture a portfolio that starts off split 50:50 between equity and bonds. In year one, equity rises by 10% and bonds fall by 10%. The portfolio is now 55% equity and 45% bonds. If the trend continues, your portfolio will become far more equity-biased than you originally intended, and so more exposed to risk. Rebalancing enables you to reset your portfolio’s asset allocation to control your risk exposure. You occasionally sell some of the outperforming assets and spend the cash liberated on buying more of the underperforming ones. Happily, this means you’re buying low and selling high, too. Making regular contributions to your portfolio has a bonus effect. Thanks to a technique called pound cost averaging, drip-feeding can provide long-term benefits when the markets fall. It works because your regular contribution (say £100 per month) buys fewer shares when prices are high, and more shares when prices falls. When prices rise again, all those cheap shares you picked up go up in price, too. This lowers the average price paid for all your shares. Forget fretting about market peaks and troughs. Just keep contributing regularly, and stick to your long-term plan. Greed makes us want the hot asset class just as the bubble is about to burst. Fear makes us panic and sell when the market falls, guaranteeing losses. It’s human nature. We’re a bundle of impulses waiting to run amok. Ignore the ‘buy this, sell that’ noise. Don’t obsessively check your portfolio. 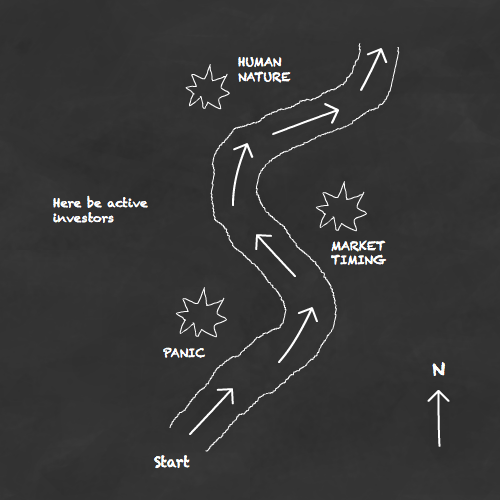 This was just a brief sketch of the index investing road ahead of you. For more on the detail, check out our passive investing HQ! Good timing to read the article. It is point 8 that i needed to read again. I will keep investing each month according to the plan. I still have some work on point 9: don’t check your portfolio too often. When it says “shares beat cash” in the table – does this mean cash or would this also include bonds? I have only equities and bonds – and have held only enough cash for things like an emergency fund and for short term items I know I need to buy like a car…should I be moving some out to cash as I get nearer to retirement? “you need to know what you’re investing for.” We’re investing “just in case”. Just in case our final salary pension schemes fail, just in case of governmental financial collapse, just in case we both need “care”, just in case we have a grandchild with huge health problems, just in case …….. I wish I could rewind 20 years as I had no idea what to do then, and what I would do is exactly as it says above. Can I not rebalance by simply putting new money into what’s gone down and thus avoid selling shares at £10.00 a pop. And just buy what’s gone down at £1.50 on a regular investment scheme? @Amber Tree — We’re glad to help! Remember these are probabilities, applied to past periods, so are only a guide not a prediction. Also “79% chance of beating” for example means there’s a 21% that shares will lag bonds over that period. I spell this obvious-sounding latter comment out because some people start calling assets “broken” and so forth when the returns don’t follow the most probable line, but there is *always* a spectrum of possible outcomes in investing. 🙂 The key is to balance risks and rewards across the spectrum as you see fit. Remember though that on many platforms there are no dealing fees on index funds (*not* ETFs though) so rebalancing an index fund passive portfolio needn’t cost a penny. @Flybynight — You’re more than welcome!